Problems among British Muslims have never unnerved me. 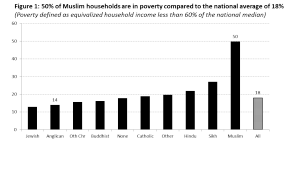 Some serious concerns do exist and they need resolving, including a significant prison population, high levels of deprivation (50% for Muslim households compared with a national average of 18%, see Fig 1), and low levels of employment, especially among women. Among some British Muslims, gender inequality exists in abundance – as does other types of prejudice – but these are forms of intolerance faced by other minority groups as well as wider society which need to be tackled. I’m not one to avoid the issues. What concerns me about Trevor Philips’ article and forthcoming documentary is that the damage will be far greater than any good it tries to impart. 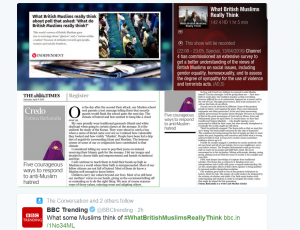 His article has already generated considerable debate in the press and on social media, using the hashtag #WhatBritishMuslimsReallyThink to offer both serious and humorous criticism of the research and article (see Fig 2). Trevor Philips’ article serves to wave a bright red paintbrush in the air and paints all 3 million British Muslims with the very same brush. I had warned against treating British Muslims as a standardised group in my book. In the very way that this survey does, it ignores the rich variation that exists among British Muslims, similar to the diversity that exists among Christians and Jews “Though British Muslims are mainly of South Asian descent, the South Asian culture is not representative of Islam itself. In essentialising Islam this way, we would be ignoring the wide variety of cultural, linguistic, historical and religious variations found among Muslims worldwide”. Others have already commented on the effect of the sampling frame used, so I’m going to focus on other issues. The title of the documentary and article suggest concern with what Muslims are thinking (as though their thoughts are treacherously hidden away from the wider public). When large-scale surveys such as the British Social Attitudes design their surveys, a wide array of relevant subjects are examined, so why could this survey not have included less stereotypical questions about what Muslims care about? If interconnectedness and community cohesion are important to Trevor Phillips, then why not ask about consideration for your elders? Respecting your neighbours? Providing a safe environment for your children? Does it question Muslims on topics such as healthcare, welfare or immigration to see if variations exist between Muslims and others? No, of course not. Instead, it contains a slew of divisive questions about Jewish people, stereotypical questions about cartoons of the Prophet, jihad and Islamic State, and questions on trust in public bodies and attitudes towards other groups. The questions themselves falsely suggest that Muslims only care about violence, dislike of other groups and are sensitive about religious matters. 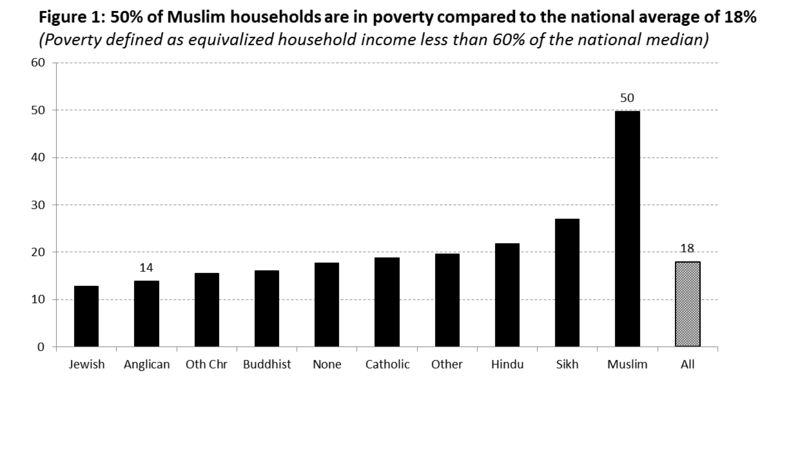 Deprivation is also relevant in impacting on religious opinions, because it is certainly the case that some attitudes could be improved through better religious literacy (for example on topics such as gender equality) which is less available for those without the means to access challenging religious scholarship, whether through the internet, courses, or religious scholars who are engaged with the grass roots. Islamic scholars in the USA are much better at this than in the UK, engaging with youth and poorer communities to dispel many of the mistaken assumptions some Muslims have on tolerance, equality, and responsibilities. Researchers have provided evidence that residential segregation is reducing over time, which is positive news, as residential segregation could possibly exacerbate social disadvantage, limiting opportunities for building weak or bridging social ties, civic engagement and the accumulation of social capital. Having said this, residential segregation has already been demonstrated to have little impact on people’s national identity and interaction with ‘others’: Using the 2010 Ethnic Minority British Election Survey data, Professor Anthony Heath and Dr Neli Demireva found “On the one hand, it is true that some south Asian groups, particularly those of Pakistani and Bangladeshi background, do exhibit high levels of in-group marriage and friendship, but they do not lead parallel lives since residential and workplace segregation is actually rather low”. As Phillips wrote, “According to ICM, more than half mix with non-Muslims daily, probably at work or college – but 30% never translate that into a friendship that would take them into a non-Muslim’s house more than once a year. One in five never enter a non-Muslim home.” I learned many years ago that in Britain, people tend to keep to themselves – maybe not so much at the bar or the pub, but homes are considered a revered space for close relatives and friends. To blame Muslims for this social culture is rich – maybe the survey should have asked more detailed questions – like have you ever been invited to the homes of your non-Muslim friends? Did you turn them down, and why? If you wish to judge people on their social networks, ask about their weak networks of non-Muslim friends, on Facebook, at the school gates or in work. How many engage in civic activities, charities and groups in their local communities? These are the really interesting issues that could provide a richer narrative and better understanding of social relationships. I’d also like to query the presumption that multiculturalism is leading to a (perceived) lack of integration among British Muslims. We are only just in our third generation born and bred, but could a partial explanation not also lie in the behaviour and attitudes of wider society? The stigmatisation and discrimination of a group has potential to cause this group to become insular. The evidence exists for such explanations, but commentators such as Phillips do not seem to wish to acknowledge it: “… perceived discrimination (both individual and group) has some of the strongest effects on negative outcomes. Discrimination is at least as plausible an explanation as multiculturalism for lack of integration”. At the end of the day, if properly conducted, surveys are useful in gathering a snapshot of opinions and views. Surveys are not interested in the nuances and variations of people’s views. Neither are they very helpful in understanding why those views exist, tracing their history, or the reasons behind them. Unless surveys are conducted over a long period of time, we are also unable to monitor changes and patterns, to explore whether particular views are indeed becoming more conservative or more liberal. And unless these surveys are conducted among other religious and non-religious groups, we are unable to truly compare across groups. As an academic sociologist working on Muslims in Britain I have myself interviewed and spoken with hundreds of Muslims. I have encountered opinions that I dislike and challenged others that I disagree with, but the diversity that exists among Muslims is a microcosm of that found on our British Isles. If we really wish to understand why “the gaps between Muslim and non-Muslim youngsters are nearly as large as those between their elders” I suggest we rely less on agenda-driven survey data made for TV programming and viewer numbers, and instead focus on quality output being provided by seasoned academics who have studied and worked in the field for years. Guest post by Dr Asma Mustafa, Oxford Centre for Islamic Studies. Trevor Phillips’ article “An inconvenient truth” was published by the Sunday Times on 10th April 2016. 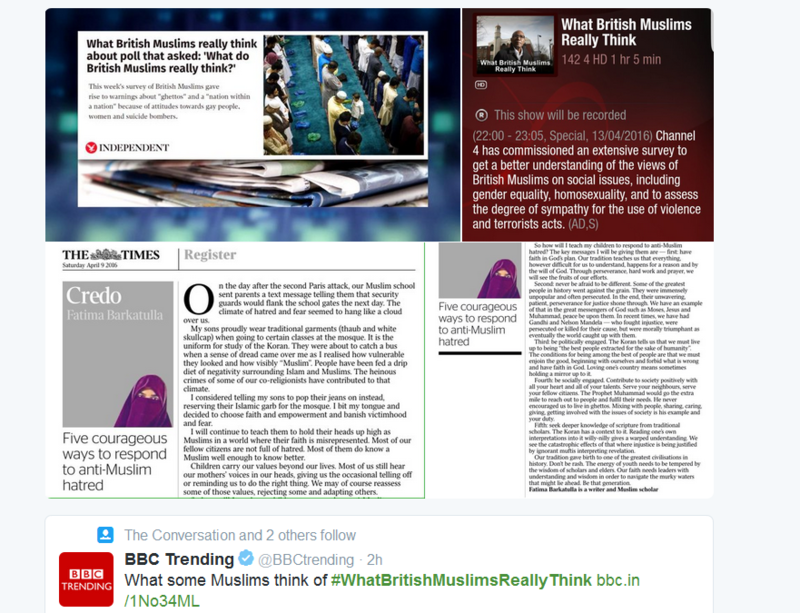 The documentary “What British Muslims Really Think” is being aired 10pm on 13th April 2016 on Channel 4.